OK, just one more Boat Show! Well, we find ourselves near Miami at Boat Show time and it doesn’t take a brain scientist to guess where we’ll be this Saturday. The Miami show is a good one. It’s not Annapolis, especially for sailboats, but there are deals and venders all in one place. 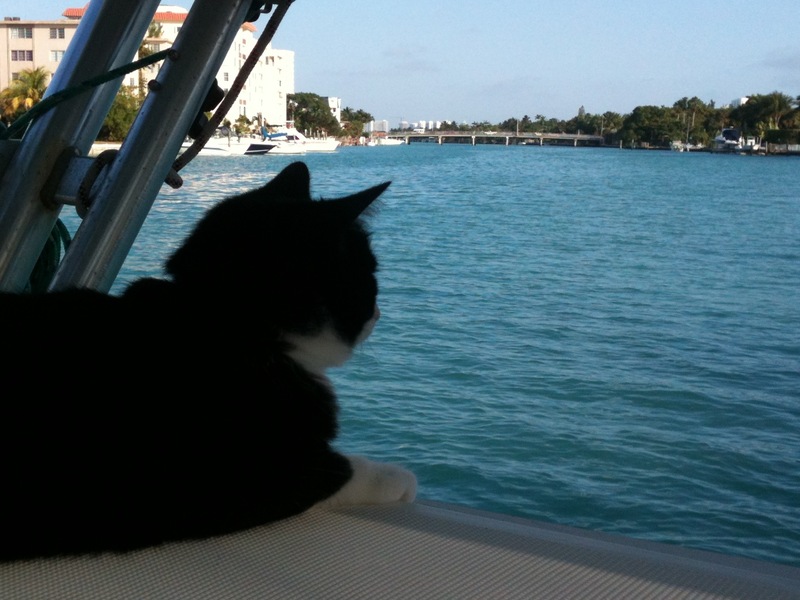 That’s downtown Miami over Izzy “Adventure Kitty’s” shoulder. We could dinghy to it. It’s very different going to a boat show when you’re refitting or updating your own boat than when you’re just dreaming. It tends to focus the mind, especially when a boat show is set up to distract. We still need a few things but the intangibles like official address change, driver license change, and vaccinations are driving us to distraction. Sometimes it’s a major victory just to get a vender to show up. here in the lap of luxury, and we plan. Ok, one last boat show. 3 Responses to OK, just one more Boat Show! Izzy is gazing at the greenery, no doubt! Or figuring out how she can catch one of the fish teasing her from below!